Jaw crusher has various specifications and models, the commonly seen ones are PE jaw crusher, hydraulic jaw crusher, European jaw crusher, PEX jaw crusher, etc. According to crushing method and discharging size, PE jaw crusher can be divided into coarse jaw crusher and fine jaw crusher. 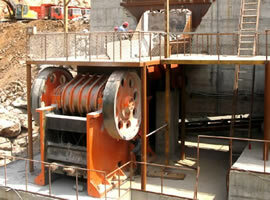 Here, we will explain the models of jaw crusher in detail. a.	PE-400x600: PE400x600 jaw crusher refers to a kind of jaw crusher whose feed opening is 400x600mm. Its particle size range of finished stone is 40-100mm. The original size of raw materials to be fed into jaw crusher 400 x 600 should be less than 340mm. Its hourly output can reach 16-60 tons. The motor power consumed per hour is 30KW. The total weight of jaw crusher 400 x 600 is about 7000kg. In general, the dimensions of the whole machine are 1730×1730×1630. b.	PE-600-900：The feed opening of this type jaw crusher is 600x900mm; adjust range of discharge opening is 65-160mm; the maximum feeding size of raw materials is 500mm; hourly output is 50-180t; motor power outputted per hour is 55KW. The total weight of jaw crusher pe600 x 900 is 17000kg. The dimensions are 2190×2206×2300mm. c.	PE-900x1200: The feed opening of PE900x1200 jaw crusher is 900x1200mm; adjust range of discharge opening is 95-165mm; the maximum feeding size of raw materials is 750mm. The rotation speed of eccentric shaft is 200r/min. The hourly output is 220-450t; motor power is 110KW. The total weight of jaw crusher pe900x 1200 is 52000kg. The dimensions are 3380x2870x3330mm. d.	PE-1200x1500: The feed opening of PE900x1200 jaw crusher is 1200x1500mm; adjust range of discharge opening is 150-350mm; the maximum feeding size of raw materials is 1020mm. The rotation speed of eccentric shaft is 180r/min. The hourly output is 400-800t; motor power is 160-220kw. 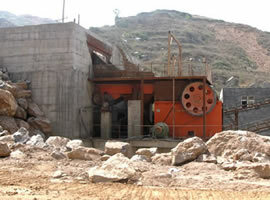 The total weight of jaw crusher pe1200x1500 is 100900kg. The dimensions are 3380x2870x3330mm. a.	PE-150x750：The feed opening of PE-150x750 jaw crusher is 150x750mm; adjust range of discharge opening is 18-48mm; the maximum feeding size of raw materials is 120mm. Its capacity is 8-25t/h; motor power is 15kw. The total weight of PE150x750 jaw crusher is 3800kg. The dimensions are 1200x1530x1060mm. b.	PE-250x1000: The feed opening of PE-250x1000 jaw crusher is 250x1000mm; adjust range of discharge opening is 25-60mm; the maximum feeding size of raw materials is 210mm. Its capacity is 16-52t/h; motor power is 30kw. The total weight of PE-250x1000 jaw crusher is 7000kg. The dimensions are 1560x1950x1390mm. c.	PE-300x1300: The feed opening of PE-300x1300 jaw crusher is 300x1300mm; adjust range of discharge opening is 20-90mm; the maximum feeding size of raw materials is 250mm. The rotation speed of eccentric shaft is 300r/min. Its capacity is 16-105t /h; motor power is 55kw. The total weight of PE-300x1300 jaw crusher is 15600kg. The dimensions are 2720x1950x1600mm.